This illustration depicts Martian water reservoirs. 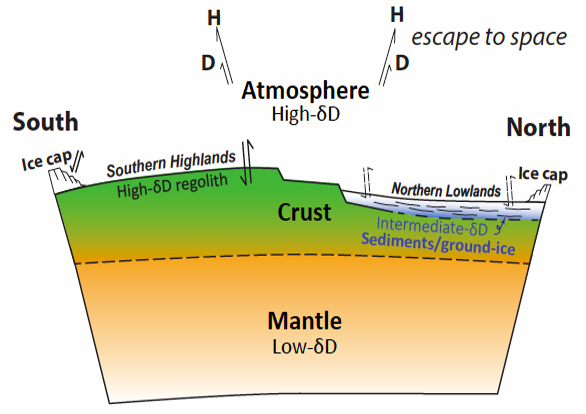 Recent research provides evidence for the existence of a third reservoir that is intermediate in isotopic composition between the Red Planet’s mantle and its current atmosphere. These results support the hypothesis that a buried cryosphere accounts for a large part of the initial water budget of Mars. NASA and an international team of planetary scientists have found evidence in meteorites on Earth that indicates Mars has a distinct and global reservoir of water or ice near its surface. This entry was posted in ASTROBIOLOGY. Bookmark the permalink.